Forklift Licence in Sunshine Coast: Applying for Forklift Ticket? Read This - Be Certified Today! For someone to be permitted to work as forklift operator in Sunshine Coast, Qld, you must be in possession of forklift ticket according to the type of truck you are operating. 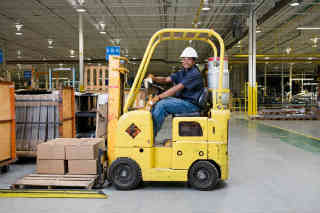 In Australia, forklift operation is classified as high risk work. And you need an HRW licence to be issued by Work and Health Safety Authority. For you to get a forklift licence, you must determine what are your need and requirement are. Are you going to operate an order picker, then you need an LO licence. On the other hand, if you will drive other type of forklift other than stock/order picker type, you need an LO licence. LO licence is regarded as “full” licence. Who is Qualified to Get a forklift Licence? Applicant must have proper training in an RTO and completed the assessment given by an accredited assessor. List of RTOs is mentioned below for your reference. An applicant must be at the legal age of 18 years old and up. Understanding of the English language. This applies when an applicant’s first language is not English. An applicant must submit 100 points of proof of identity. See reference here. To be fully trained and competent driver, you need to sign up in class scheduled by an RTO. List of RTOs in Sunshine Coast is below for your information. Attend the Formal Training. This is classroom lecture part of the course that usually last for 1 day or so. But the length of this part may depend on comprehensiveness of the training you required. If you are total novice, it will take 2 days, if you have prior experience, it only takes 1 day to complete this. The next part is assessment. An accredited assessor will give you written exam and practical driving test. This is to ensure that applicant acquired necessary skills to drive the forklift. Some applicants fail this part, and if you are not successful in the first try, you can immediately take this again without having to wait for another schedule. After completing the assessment, the RTO will issue Statement of Attainment (TLILIC2001A) and assessor will give you the assessment summary (AS1 form). Necessary hours of forklift operation must be included in the log book. This is something every beginner must have in order to qualify for training assessment. If you do not have such accumulated number of hours in the log book, you and your trainer must complete this to ensure that you have received the skills and abilities to take the mandated training assessment. Once you obtained the Statement of Attainment and AS1 form, you need to complete these requirements in order for you to lodge those to the nearest Australia Post. Application form that you can get from Australia Post. 100 points evidence of identity. See reference here. Photo. Your digital photo will be taken at the Australia Post or you can submit your recent one. Application fee of $70. Payment can be made in the form of credit card, cash, cheque, etc. You need to lodge your applicant for HRW licence within sixty day (60) days after completing the assessment at RTO. You can perform high risk work or forklift operation by presenting the Notice of Attainment, Assessment Summary and receipt issued to you by Australia Post. These are your confirmation that will serve as interim ticket, that you have submitted your application for HRW licence awaiting for its release. Listed below are the RTOs in this area that provide forklift licence course. If you want to know how to choose the best forklift training schools, click here. It can help you make decision where to get the forklift training. RTOs can deliver the training at their own facility or at the employer’s site. If employer requested to deliver the training on site, they must provide such facility at the premises. This is the effective way of training delivery, because the trainer can modify the course according to the workplace condition, knowledge and behavior of the forklift operator. If applicant is working for national company that has an arrangement with an RTO in Queensland. Applicant must secure a letter from their employer as evidence of commercial arrangement. This is to be submitted together with all the requirements when lodging the application.